KITS technologies offers Virtual Private Network (VPN) solution over Fiber optics and Satellite Networks. Our VPN solution allows organizations with multiple locations (branches, offices etc.) to connect and work together in a single private network. With KITS VPN solution, geographic location of your branch offices is no longer a barrier to communication. Your team will seamlessly and easily communicate and use critical business applications remotely without boundaries. KITS VPN solution empowers organizations with a cost effective way to improve performance through timely coordination and simultaneous running of business functions, including the use of common central database/ applications across all branches wherever they are located. With KITS VPN, your organization will substantially reduce communication cost, keep branch offices securely connected and create reliable infrastructure and environment for your team to work smarter, faster, and better together, anywhere and anytime. 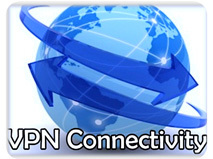 Virtual Private Dial Network (VPDN).